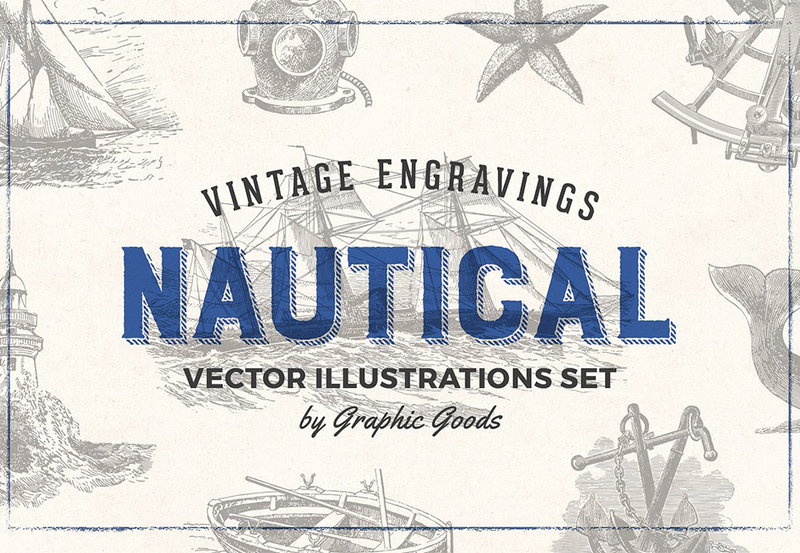 A collection of engraving style nautical illustrations, restored from old 19th-century books. 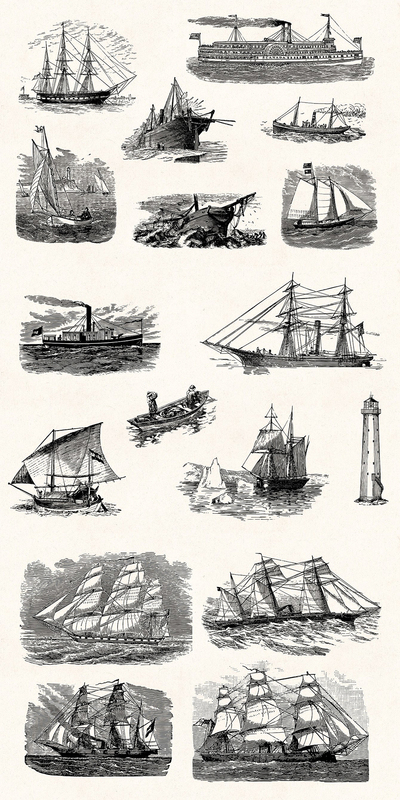 This set contains many marine-themed images, including different boat and ship types, such as yacht, steamer, frigate, sloop, schooner, tartan, skiff etc. 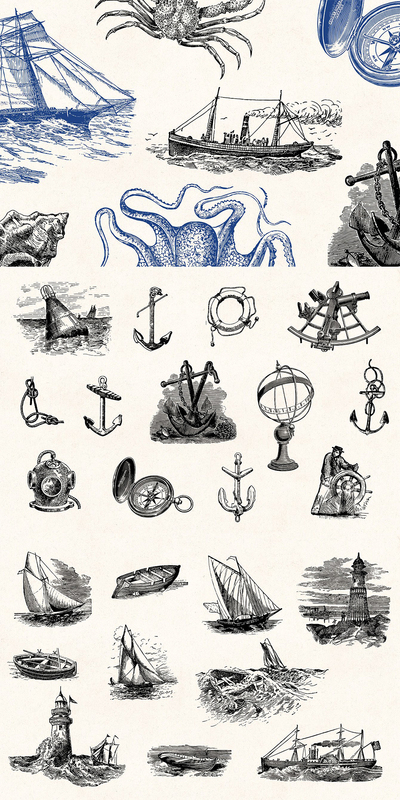 It also features drawings of lighthouses, anchors, sextant, compass, buoy and variety of sea life such as octopus, squid, whale, blowfish, ray, shells, seagull etc. 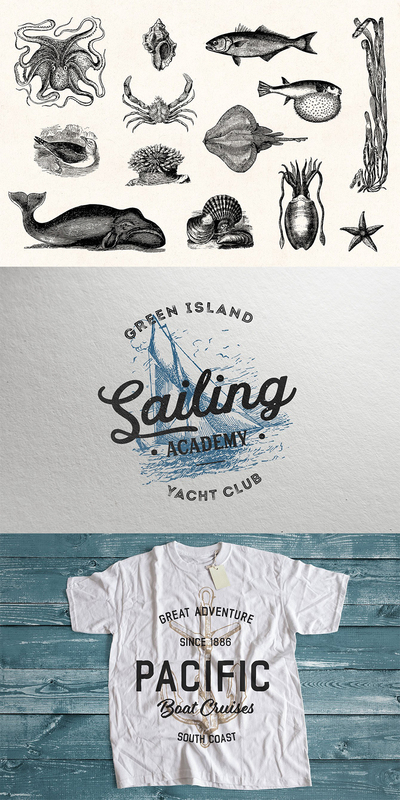 These illustrations are perfect for wide variety of projects, for example, logos and branding, fabric and apparel design, patterns, packaging, stationery etc. It’s also very suitable for decoupage and scrapbooking. Software compatibility: Adobe Illustrator CS5 or newer, .PNG files will work with most graphic software, .EPS files will work with a variety of programs such as Adobe Photoshop or Illustrator, Sketch, InkScape, Affinity, Corel Draw, etc. 53 elements in .PNG and .EPS format. Software compatibility:Adobe Illustrator CS5 or newer, .PNG files will work with most graphic software, .EPS files will work with a variety of programs such as Adobe Photoshop or Illustrator, Sketch, InkScape, Affinity, Corel Draw, etc. File size is approx 82MB (121MB unzipped), offered as a single download.